All transactions are safe and secure with a reliable history in online purchasing behind each of our associates. Buy the Boondock Saints Hoodie to own Boondock Saints clothing and merchandise. This black Veritas Aequitas Boondock Saints hoodie is the perfect way to stay warm on a chilly day. The pullover hoodie features a classic white Veritas Aequitas design on the front that includes the movie's recognizable cross in the middle. These coveted sweatshirts are hard to find and sure to fulfill your expectations. Click to preview the design in its entirety. The design on these Boondock Saints sweatshirts rivals those on other apparel. 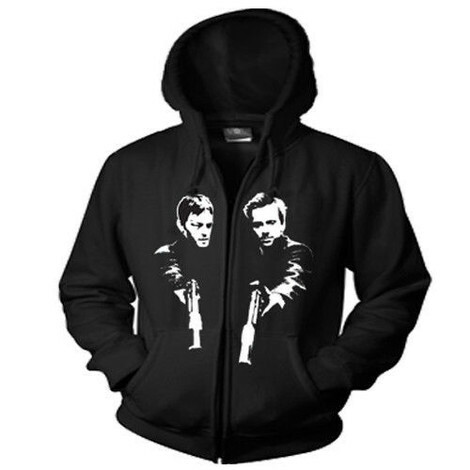 In addition to the Boondock Saints Hoodie above, browse the Boondock Saints Clothing Gallery for more apparel like men's and women's clothes, kids shirts or hoodies.